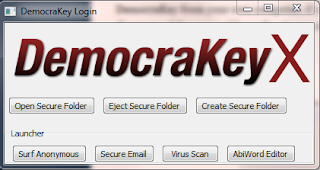 DemocraKey is a portable internet privacy suite, it contains some individual applications including Tor, Firefox browser, Clamwin, Thunderbird, TrueCrypt, and Abiword. They are all portable, so we can put them in a USB drive. Actually, DemocraKey tries to sell this privacy suit with a 4GB USB drive, the price is $99 US dollars. But we can also download this privacy suite without purchase USB drive for free. We can run an application individually, like click "Surf Anonymous" button, the TOR will run and launch a Portable Firefox. Click "Virus Scan" button, it will run Clamwin to scan your hard drive. You can also to create a secured folder, just click "Create Secure Folder" button, it will run TrueCrypt. Everything runs in your USB drive, very easy to bring to go.